Gin: The Much Lamented Death of Madam Geneva: The Eighteenth Century Gin Craze, Patrick Dillon, Justin, Charles and Company, 2002, ISBN 9781932112009, 368pp. The problem with this book is that it’s uneven, in both its content and its writing style. 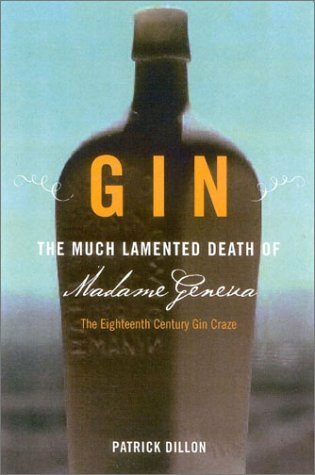 Writing about gin in the 1700s, Dillon does an excellent job of finding and presenting the sources that reveal both the origins of gin, reasons for its initial growth and popularity, the successive attempts and prohibition and the eventual compromise of restriction but acceptance. Unfortunately, while belaboring some of this information, he expects and doesn’t explain some of the more unusual aspects of eighteenth century England, such as exactly what magistrates were and how much power they wielded. It would have been useful, as well, when he was connecting the government’s policies regarding gin to the greater politics of monarchical succession and conflicts between England and Spain to have given a small primer in both. Instead, you have to figure a lot of this extra knowledge by simply having been familiar with these topics prior to reading this book, by referencing other works to fill in the gaps, or attempting to understand these issues by reading between the lines. Ultimately, this was very frustrating. And that’s too bad, because Dillon’s topic and argument is timely and interesting. Although he has an epilogue that underscores this point, Dillon’s depiction of England’s dance with Madame Geneva is unmistakeably an object lesson that has already been ignored once by the United States, during the 1920s, and is being ignored once again today in the War on Drugs. Truly, those who ignore history are doomed to repeat it, and this is history that has been ignored so long that it is forgotten. There are reasons for it, for the forces of moralism and sobriety, driven by their fundamentalist doctrine, have not given up their battle against intoxicating substances no matter the pragmatical realities and lessons of the past. We can only hope that, like England’s Gin Act of 1751 and the repeal of prohibition in the U.S. in 1929, there will be a future day where an armistice is declared and we can take control of the drug trade, and, ultimately, attack the root causes that drive people to abuse substances.